As a former graphic designer, i was amazed by new platforms that allow us to create our own content (blogs, email campaigns, landing pages, conversion pages). But this platform is the first one that simply takes us to more type of design (banners, social media images, flyer). Desygner with a “y” because “y” does design needs to be so hard? And that’s kids, it’s NOT how we name our startup. Puns aside, our brand name embodies our brand promise which is to enable anyone to design something beautiful without wasting time on complicated tools, or spending money hiring a designer to create very basic artwork or make small changes. With Desygner you are the designer. Even though Desygner is located on the Gold Coast in Australia, it was established by Englishman Alex Rich, Brazilian native Mariana Aguiar and Indian-born Sayan Bhattacharyya. We love the diversity Australia has to offer, and our team is very multicultural. 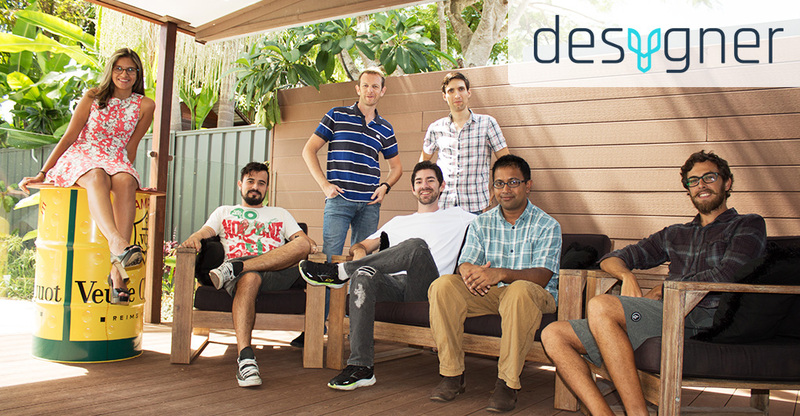 Our developers, designers and marketers are from Brazil, Spain, India, France, Russia, Argentina, United States, England and Australia, which helped us to build Desygner with a very international audience in mind. With the number of users and designs made on a daily basis growing to the thousands very quickly, the work on the product continues with more intensity than ever. As the CEO, Alex is in charge of planning the next phases of development, looking after the financials, and giving the team the support they need to succeed. As the CTO, Sayan manages the whole technology side, and as the CMO my daily work involves listening to users’ feedback, managing the user experience and how they interact with the product, planning the next launches, writing content, and helping people to find us. Our co-founders Ignacio Díaz and Alexandre Goloskok are in charge of website development, and mobile development respectively. And as startups are not all fun and games, we all share some of the administrative tasks as well. Simple, opened and from any device. We focused on developing a stable platform with an easy to use editor where what you see is exactly what you get. We offer millions of royalty free images at no charge, and the ability for users to quickly get content from their social media channels, drives, and import elements from existing PSD and PDF files. We also recognize that no matter if you are a marketer, a blogger or a business owner, a lot of your working activities happen on the go, so we dedicated a lot of time to develop a technology that could work from mobile devices. How do you sell your product? As we are in Beta, we are focused on making Desygner better upon every release. We have not spent any money on paid advertising, and most of our traffic is organic, from word-of-mouth referrals, and the many blogs who have reviewed the product. Any advise for your entrepreneurs? To focus first and foremost on getting to Product/Market Fit. A lot of us entrepreneurs tend to fall in love with our own ideas, and forget that for a business to be successful it needs to meet a strong market demand. Even though we set up to be an Internet company, we started with no Internet. Because of the office touristy location and drama with 2 different Internet providers, our very first prototype was developed without a broadband connection. But the Internet issue was not going to stop us. Let’s just say that we went to Starbucks a lot. I was suggested this blog by way of my cousin. I am not sure whether this post is written by him as nobody else realize such specified about my difficulty.